With two weekends of racing in a row in Southern California, I opted to stay down in the LA Area between the two events. Red Bull HQ is located in Santa Monica which made it an easy choice to head to the beach for a few days of gym workouts, hard training and exploring the local scene (and cuisine). Between race weekends, I often have one or two key workouts to keep building fitness and get the body ready for another hard effort. Tuesday brought a very hard workout on one of Santa Monica’s steep climbs - and certainly left me in need of refueling. Enter: tacos. We had driven by the hip Tocaya restaurant many times and were eager to test it out for ourselves. The restaurant is on a corner in Venice Beach and boasts organic, fresh, local ingredients as well as trendy decor. Given it was a Tuesday, we opted for their tacos which were discounted for our favorite weekly holiday. Their taco menu is a bit interesting - offering preselected preparations that can be paired with various meat and cheese options. I went with the chef recommended pairings and was not disappointed. I tried a cali tacos with achiote chicken and manchego cheese, the tulum taco with chicken tinga and queso fresco and the barrio taco with carne mold and jalapeño jack. To drink, I had a strawberry basil aqua fresca. Brad and I also shared guacamole with plantain chips to start which I HIGHLY recommend. The ambience is also notable for this spot. You order at a walk up counter, take a number and sit either outside or in their hip back patio. It has a very LA vibe and is both casual and nice. Overall, the food was to die for. The tortillas definitely tasted hand made and were thick. Personally, I am a fan of one, thicker corn tortilla rather than two thinner ones which often don’t stand up to the job. The meats were deliciously spiced and very flavorful but the preparations left them tasting fresh and clean. The unique preparations enhanced the flavors in a way that absolutely exceeded your average taco. My only knock is that the tacos are a bit small and pretty pricey - but in no way does that undermine their deliciousness. Every year, I am lucky enough to start my season close to home with the US Cup series season openers in Southern California. Arriving in San Dimas feels a little like deja vu after racing here since my junior days. It is a great first opportunity to test the legs and see where I stand after a long winter of preparation! This year, things got a little more interesting when a crash and resulting back injury left me side lined just a few weeks before the event. With the help of my amazing team of physical therapists, coaches and Red Bull’s guru bodyworker Adam - I was back on track and so happy to be lining up for the first race of the season. 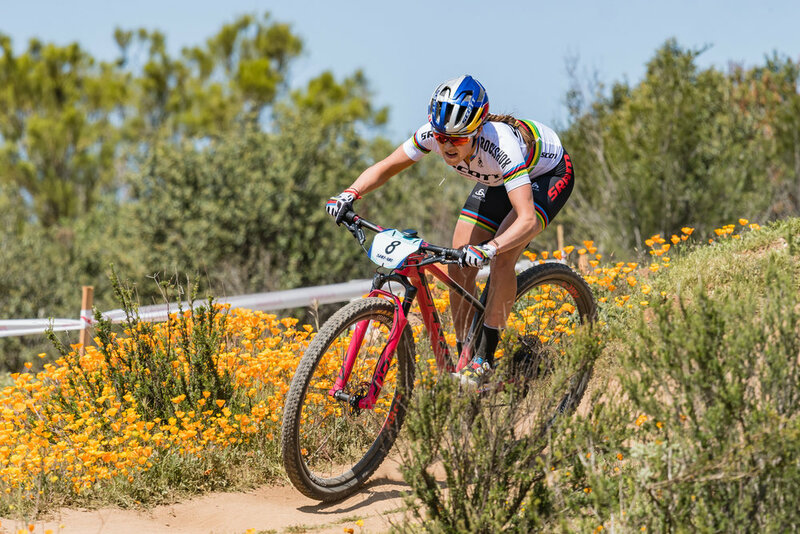 This race was extra special as it marked the first time I would race in the rainbow jersey and as a member of the Scott SRAM MTB Racing team. My incredible mechanic Brad had my race bike dialed and I was excited to see what the Spark could do when finally put to the test. Despite some pre race nerves, I quickly fell back into the racing rhythm after the gun went off. By opting for my full suspension and dropper post, I was able to attack the descents and managed to get a small gap on the first lap. Things came back together in the middle and I found myself battling with Erin Huck for the lead. In the end, I was able to get away and take my first victory in the rainbow jersey in front of my family and friends! A huge thank you to the crew that makes these early race opportunities possible and to ShoAir for bringing some serious points to the USA. Overall, it was a great weekend and was as much of a bike race as it was a reunion with all of my favorite racers and members of the American cycling community. It did, however, leave me very hungry…. As Brad and I headed out of town, it was imperative that we refueled properly. These consecutive weeks of racing don’t fuel themselves. Enter: Taco Grill. Unassuming name, fire tacos. Taco Grill is one of those places that chooses to focus on a few things - and does them to absolute perfection. The appearance of the restaurant is very simple, with only a few seats and a very small walk up counter. Don’t be fooled. I ordered three tacos while Brad opted for the five taco sampling to get a taste of all the flavors. After talking with the the host (whom we LOVED), it was clear they take great pride in their food and choose to focus a lot of their time on having really high quality ingredients - specifically their meat options. Sorry to vegetarians but the meats were incredible and included a variety of slow roasted, carefully seasoned and/or fire grilled deliciousness. Highlights also included fresh locally made tortillas delivered daily, two options of salsas (get the hot one, you’ll sweat it but you won’t regret it) and home made tortilla chips. As for the tacos themselves - they were fresh tasting, classic and perfectly executed. Hands down, one of the best taco stops to date and shouldn’t be missed. We pretty much spent the rest of the day wishing we could go back and relive that experience for the first time. While that may be impossible, we will definitely be coming back next year! 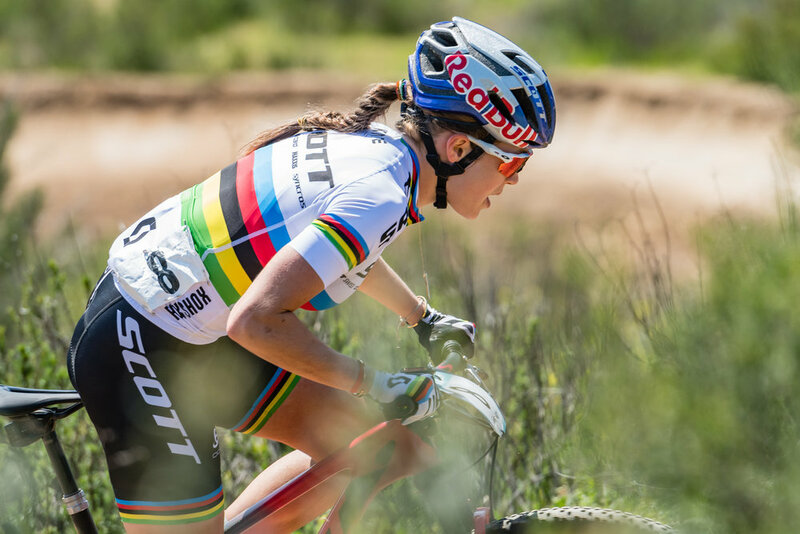 As the newest member of the Scott-SRAM MTB Racing Team, I was particularly excited about team camp! This year, we kicked off the season in Tucson, Arizona where we enjoyed two weeks of training, product testing, team bonding and of course taco eating. Highlights of the week included getting my sparkly customized Scott Spark race bike, getting to work with the engineers at SRAM to test products and dial in suspension settings, and - of course - many laps of Mount Lemmon. Needless to say, the busy week left us ready to refuel. After my teammate Nino professed his own love for tacos, it seemed the stars were aligning. After some light googling and receiving recommendations from some local pros, there was one name that kept coming up - Seis Kitchen.Despite the clarity of my decision, I still managed to slightly screw it up. We arrived at the closest Seis Kitchen to find it was actually the sister take out stop of their larger restaurant downtown. Luckily, they had heat lamps, some Mexican music and a bar across the way to provide our requisite margaritas - but the pressure was on for this food to be worth making everyone sit out in the cold. I was feeling the heat. Plates of tacos soon began pouring out of the kitchen. There were many delicious options which led to some tough decisions - but everyone seemed to be feeling good when warm plates landed in front of them. Personally, I chose to order three different tacos with a side of black beans and a side of zucchini. My three selections were the crispy avocado taco, a chicken taco and a taco al pastor. They came out topped with chunky salsa and cheese and wrapped in fresh home made corn tortillas. My favorites were absolutely the crispy avocado tacos - highly recommend. Overall, I think the food definitely redeemed my choice and put Seis Kitchen at the top of my list for my next trip to Tucson! After a few weeks in Europe for the 4th and 5th rounds of the World Cup, it was finally time to head back to America. My teammates Howard, Chris and I landed on the east coast in the afternoon, eager to kick off our annual Nationals race trip. This year, Nationals is being held in Snowshoe, West Virgina - a very remote ski resort with notoriously rooty, fun technical trails and no grocery stores or cell reception for miles. Rather than head straight to Snowshoe, we stopped over for the night in Harrisonburg to get in a short spin and fuel up before making our trek up the mountain. Luckily, we were reunited with my mechanic Brad at the airport who picked us up and squired us about the town. By the time we were checked into the hotel and bikes were built, it was already around 6:30pm. The jet lag was hitting us all hard and it took all of our motivation to get out for a short sunset spin. I always find that, no matter how late or short the ride, just getting back on the bike after a travel day is essential for the mind and body. A few minutes of riding on Pleasant Valley Road and we were all feeling like new people. The only thing missing was dinner - and the tacos were calling. The Taco Spot: Proximity played a large role in the selection of this spot, but we were certainly not disappointed. The Sub Station Mexican Grill is located in the outskirts of Harrisonburg, conveniently a 4-5 minute walk from the Hampton Inn depending on how jet lagged you are. From the outside, this restaurant looks a little funky. It's in a small, unassuming brick building snuggled between a used car lot that may or may not be abandoned and across from a dunking donuts. I tell you: do not judge a taco by its tortilla. Once inside, you are greeted by the sound and smell of meat sizzling on the grill. We took our seats and a basket of chips and giant mugs of water quickly found their way to us. As we began to peruse the menu, we were a bit surprised by the variety of offerings. From sub sandwiches to burgers, I was starting to wonder if the tacos would really be the star of the show. The insatiable Chris Blevins ordered some nachos for the table and Brad and I decided to share the steak fajitas as well as an order of the tacos al pastor. Brad also ordered a margarita and when asked about sizing, the waitress responded, "we have one size. It's a 20 ounce fishbowl". There you have it folks. 20 ounce it is. Innumerable baskets of chips were consumed as we waited for the food to arrive. Though they required some salt, they were warm, delicious and irresistible. First up - the nachos. While the nacho cheese was somewhat standard and left a bit to be desired, the corn and jalapeños saved the day. The fajitas sizzled on out in a pan a few minutes later accompanied by a little foil wrapped side of tasty corn or flour tortillas. Though they required some assembly, the fajitas made great little tacos. The steak and chicken fajitas were both delicious. It should come as no surprise that the tacos were definitely the highlight of the meal. One order consisted of four delicious tacos al pastor. The meat was very flavorful and wonderfully crispy having sizzled on the griddle with diced pineapple. The meat was topped with cilantro and thinly chopped onions, nestled in soft corn tortillas and served with a lime. There was also a side of tomatillo green salsa, however, it was somewhat watery and wasn't my favorite. Overall, however, these tacos tasted like a very authentic version of tacos al pastor and were definitely worth coming back for. It's safe to say that altitude camp has not quite gone to plan - but sometimes plan B can end up having some improbable, yet pretty magical moments. While the last few weeks have been a bit of a journey with a little injury - they have left me with a newfound appreciation and gratitude for the gift of riding my bike, the amazing team of family and friends that make it possible, and - of course - for the tasty tacos along the way. I drove up to Tahoe to spend a few weeks breathing very little oxygen at 7000 feet and putting in some serious work with the next few World Cups in mind. Unfortunately, just a few days into my trip - I started having some anterior knee pain and feared the worst. I tried to be conservative and took complete rest from the bike while working to isolate and solve the problem. For cyclists, overuse injuries are pretty common but can also be incredibly difficult to deal with and carry a lot of uncertainty. After several PT visits, a lot of frustration and many hours of stretching, icing, foam rolling and cross training while trying not to go crazy - I finally made some headway. The knee pain was likely caused by some worn out cleats and a huge week on my road bike, which has slightly different geometry than the mountain bikes I race and ride more often this time of year. After a few ups and downs, I was finally able to turn the corner with the help of an amazing team and miracle bodyworker Adam (HUGE shoutout to Adam the genius guru) who, among other things, realigned my hips and managed to almost immediately alleviate the pain. The next few days, I eased back into riding and became more and more hopeful. Every pain free pedal stroke put a smile on my face as I began to string together longer and longer rides. The first week back, I did double days every day - keeping the time of each ride relatively low while managing to sneak in more volume on the bike. Ride, lunch, nap, ride, repeat. I was on one of my evening spins when I got a call from my Red Bull athlete manager Aaron Lutze. They had just gotten off the boat and were headed to our favorite taco joint - Taco's Jaliscos. "Cruise over and I'll drive you home" - he offered, sounding like a real life superhero. I rode pain free all the way to tacos and had this overwhelming feeling that things were exactly as they needed to be. A surprising moment of grace after a tricky few weeks. While I had taken a little more rest than I'd hoped, I had gained a huge appreciation for this amazing sport I get to call my job and for a healthy body that can accomplish incredible things. Not only that - I realized how many people were willing to help me in a time of need. Whether by arranging for time with a PT, sending a new PowerDot system, offering KT tape, being there with words of encouragement and moral support or meeting me with tacos at the end of a successful ride, it was these people that helped me heal physically and mentally from this little bump in the road. The Taco Spot: Tacos Jalisco is a local favorite for anyone in the Truckee area. It is tucked just off of Donner Pass Rd in downtown and is the perfect place to end an epic mountain bike ride on the amazing trails in Tahoe. They recently expanded the restaurant so there is plenty of seating if you'd like to lean up your bike and take some time to relax. I would describe their food as authentic and relatively simple but good. 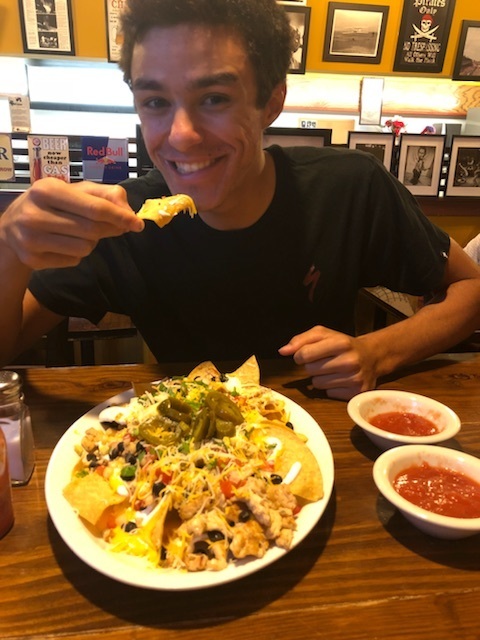 During my altitude camp, I have been here quite a few times and have tried to sample a variety of their taco offerings. My favorites - and if you ask, the option they most recommend - would have to be the carne asada tacos. 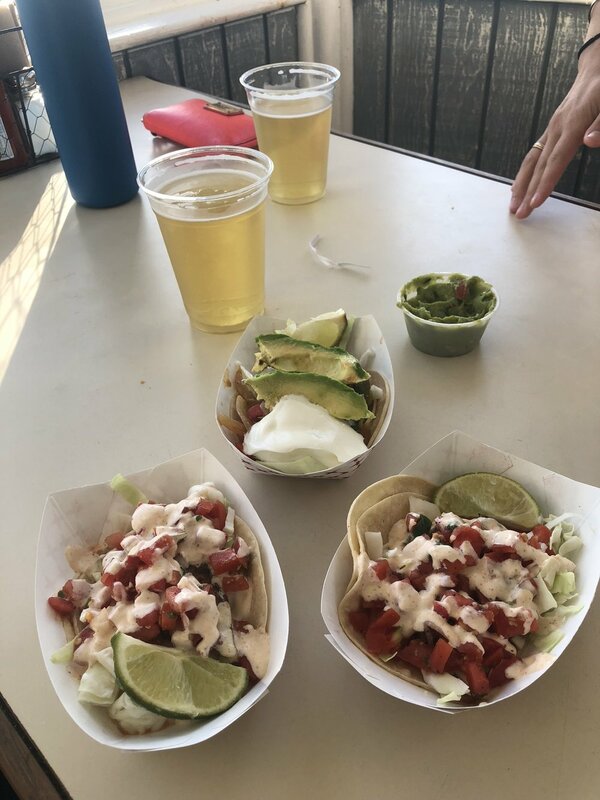 They are the size of street tacos so I definitely recommend ordering a few - I usually get two and guacamole on the side, but after a big ride, my boyfriend easily downed five so don't be afraid to go for it. I also tried the pastor, pollo, and chorizo options which I also really enjoyed, but thought were slightly less notable than the carne asada. If you order the tacos with chicken, I recommend getting guacamole to add! Pro tip: First of all, make sure that you try their house hot sauce. It will be in a little plastic container at the center of the table and you might miss it if you aren't paying attention! Don't be fooled by it's casual appearance - it is unreal. The darker red one is just the right amount spicy and will make anything you eat taste fantastic! Ride Recommendations: I am definitely not the expert on the trails in the area and there are too many great ones to mention - but I do have a few favorites! Unfortunately, the file was lost from the amazing gravel ride I did - however, if you get the chance to ride out to Boca and Stampede Reservoirs, I highly recommend this as a road ride with the option to add a little dirt! To take the dirt home - just hop on Boca Rd at the Reservoir and take the gravel towards Prosser Reservoir. Eventually, you will get yourself back to town. It's pretty clear on a map, has very little car traffic and is breathtakingly beautiful! Finally - I highly recommend climbing the iconic Old 40 highway up to Donner Summit. This is one of my all time favorite climbs and is great for intervals! It has unbelievable views and should definitely be on your cycling bucket list for this area. There are so many epic rides that have ended at our favorite local taco shop! One of my favorite adventures took place on gravel bikes this past winter. With a long day on tap and talk of a long fire road climb I had never ridden, it was bound to be epic. We actually decided to drive to Pescadero to start out, head to the Butano fire road and hit plenty of single track before we went back. Butano is just over an eight miles long with 2000 feet of climbing and plenty of fun dirt. It ends at the boundary of the Butano State Park where we ventured into the Big Basin State Park and began the long climb back up Highway 9. It was a long ride - which calls for a big meal to refuel. We got back in the car and headed home to our favorite spot - Sancho's! The Taco Shop: My favorite taco shop in the area is called Sancho's. It is located just one street over from Palo Alto's bustling University Avenue and would be easy to miss if you didn't have the local pro tip. The restaurant has indoor and outdoor seating and a very welcoming vibe. There is a bike rack in front with tables and chairs next to it. I recommend leaning your trusty steeds on the racks, going in to order, and returning to the table outside with a variety of tasty salsas from the salsa bar. First of all - it is important to note that Sancho's only takes CASH. Being able to eat the tasty food at this restaurant is pretty much the only reason I ever go to the ATM anymore - and I promise it's worth it. While I have heard great things about their burritos, my order at Sancho's over the past few years has remained the same - two fish tacos with corn tortillas. I can't recommend these tacos enough! Personally, I think the corn tortillas make a big difference. Regardless of what they are wrapped in - these tacos are something special. They come with homemade salsa and some kind of secret sauce that I really can't put into words but absolutely love. I also highly recommend squeezing a lime over the top! Finally, it is worth mentioning that Sancho's has great salsa. On particularly long rides, I have been known to finish a basket of chips and cup full of salsa even before our tacos arrive. My favorites are the green salsa or the extra spicy red option! Whatever your preference, you are in for a real treat. What is the best time to enjoy a taco? Easy. After a big adventure ride with your buddies! This past week, I ventured out on my cross bike to try both a new route and a new taco spot. Even after growing up in Marin and spending so many hours on the bike exploring it's beautiful trails and roads, it amazes me that I can string together completely new adventure routes. Nothing is more motivating to me than the thrill that comes from embarking on a new path, turning left where I have always gone right and opening myself up to the unknown. This route involved some incredible road climbs, a bit of single track and some of the most iconic and beautiful roads Marin County has to offer. While I have ridden all of these sections individually on mountain bikes or road bikes, it was a whole new adventure to string them together on my cross bike. The strava route is linked below for those interested! 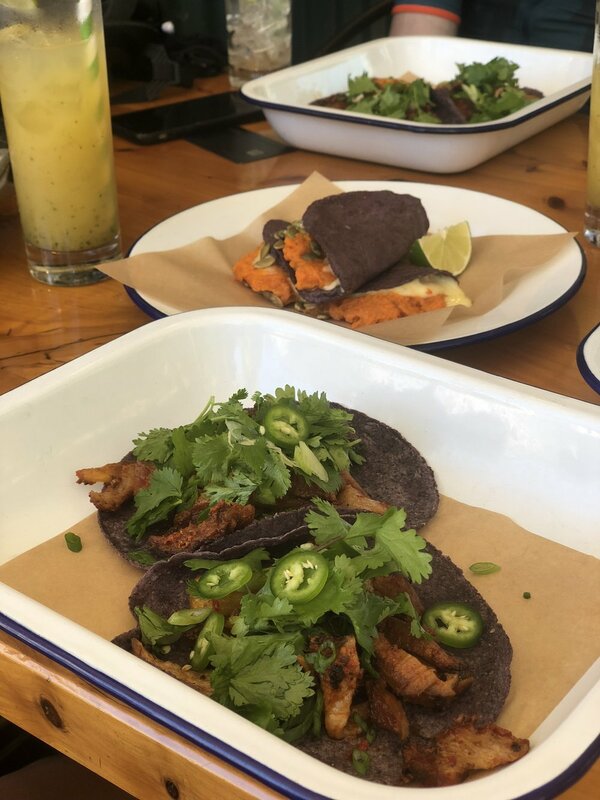 The Taco Spot: After over four hours of mixed terrain riding with temperatures hitting the high 90s, we were completely smoked by the time we rolled up to Mas Masa in Fairfax, California. This relatively new restaurant advertises "California-inspired Mexican street food" and is another very hip addition to Fairfax's downtown. I was eager to try it and this adventure ride certainly called for some tacos to refuel. After our hot ride, just walking into their air conditioned restaurant was a glorious experience! We immediately ordered a few of their homemade agua frescas which absolutely did not disappoint. These were the perfect remedy to a hot summer day and had just the right amount of sweetness! I ordered Tacos al Pastor and couldn't resist getting a sweet potato quesadilla to share. We took our seats, downed our agua frescas and eagerly awaited the arrival of our food. My Tacos al Pastor arrived just in time to fight off my post ride hanger and I got to work. These tacos were the epitome of simple, yet very high quality. They featured a hand made corn tortilla which housed a delicious pile of heritage pork and a topping of cilantro and peppers. It was love at first bite. I really enjoyed how delicate, yet flavorful these tacos were - although I do wish the portion sizes had been bigger. As far as tacos go, these were incredibly delicious but, in my hangry opinion, were not quite enough bang for my buck. For me, the sweet potato quesadilla may have been the star of the show. Sweet potatoes are one of my all time favorite foods and I found that combing them with pepper jack cheese, toasted pumpkin seeds and wrapping them in a handmade blue corn tortilla only deepened my affection. I will definitely be going back for unique and tasty morsels! The Ride: Here is the strava link to our awesome adventure ride. 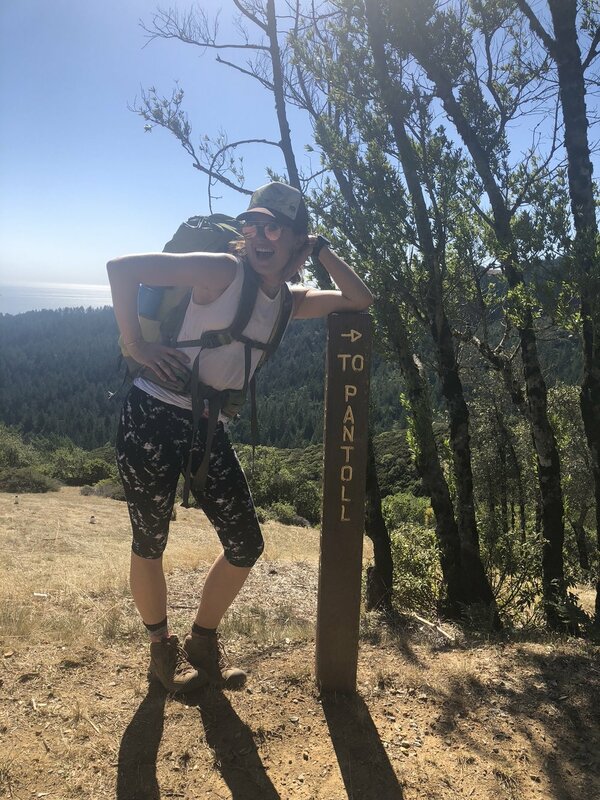 It features a dirt climb up Railroad Grade, single track descending on the famous Coast View Trail, a stretch of road along the coast through Stinson and Bolinas and finally - an epic (and *slightly* steep climb) climb up to the Bo-Fax Ridge Fire Road. This will drop you out at the top of the Alpine Dam climb which is a short road ride from Fairfax and your eventual stop at delicious tacos. I'd definitely recommend a cross or adventure bike (I rode a Specialized Crux and Will rode a Specialized Diverge) for this route! This past week, I learned that a quick trip to Bend, Oregon is always great for the soul. I arrived mid day, grabbed a Clif Bar and Red Bull and headed straight from the airport to the trails. There is no time for lunch when there are people waiting who are willing to shuttle you on Tiddlywinks! I built my bike in the parking lot, ripped trails all afternoon with the Red Bull crew and left enough time to shower and change before the eagerly awaited premiere of North of Nightfall that night at the Tower Theater. Side note: this film is incredible and I highly recommended seeing it. The next morning, we headed out early for another ride before my 1:50pm flight home. We rode around 20 miles of amazing single track and were only slightly worried when we rolled into the parking lot at 12pm - a little less than two hours before my flight. In my mind, it's always worth it to get a few extra minutes on the trail - even if it means a rushed bike pack and a speedy drive to the airport. I stood in the middle of the parking lot in my kit and scrambled to get my bike packed as it started hailing. Suffice it to say - I did not take off my rotors, but I did all the other important things. At 12:07pm, it was done. I hopped in the car with my athlete manager (shoutout to Aaron Lutze for putting up with me) and we booked it to the Redmond airport. At 12:40pm, we rolled up with plenty of time to check my bike and get through security. There was just one problem - we hadn't gotten lunch. After eating another Clif Bar meal for breakfast to maximize time for our epic ride, I was pretty hungry. A quick google search revealed a Mexican restaurant just a few minutes away. "Should we just go full send? ", I asked Aaron. We pondered for a moment, but there was no real decision to be made. I ran into the airport, checked my bike, ran out and jumped back into the car. By 12:50, I was ordering up "tacos especiales to go" at La Frontera. We waited eagerly, knowing this was a pretty savage move if I wanted to make it back to San Francisco that day. But soon, I was back in the truck holding a styrofoam to go box filled with deliciousness. I made it to the airport 40 minutes before takeoff, cruised through security while still wearing my kit and made it with plenty of time to change into some lululemons and enjoy my pre flight tacos victoriously. What a day. 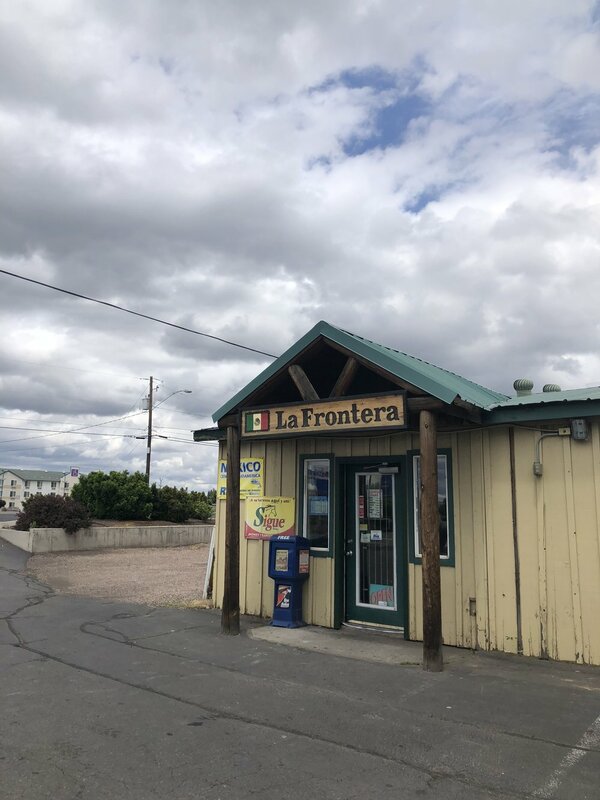 The Taco Spot: La Frontera is located in a small building on the side of the highway and, at first glance, almost appears closed. Inside, however, it is bustling with authentic Mexican music, delicious food being prepared and plates of tacos and tostadas being carried to nearby tables. It was hard to take my eyes off them. The wall above the cash register is papered with pictures of each item on the menu - with simple descriptions above them in spanish and the service was friendly and speedy, which was very important on this particular occasion. They also have warm, home made chips next to a case filled with amazing salsas. As I waited for my meal, I ate a little basket of chips and tried each of the salsas (the green turned out to be my favorite). As my main course, I ordered two chicken tacos with a side of rice and beans. I was warned that the salsa would be extremely spicy to which I replied "I love spice". It was very delicious, but also very fuego so I recommend being prepared with a bottle of water and a napkin to wipe your tears. I will also note that all of their tacos are served in corn tortillas which makes ordering gluten free very easy. The tortillas were a highlight - they were white corn, just a tad crispy on the outside and didn't fall apart when you held them. The rice and beans were also a great side - the rice had little bits of vegetables in it and were a great compliment to my tasty tacos. Overall, the food tasted great - particularly after a long morning of riding trails. I highly recommend seeking out this gem if you are in Bend and, especially, if you are tight on time before or after a flight! 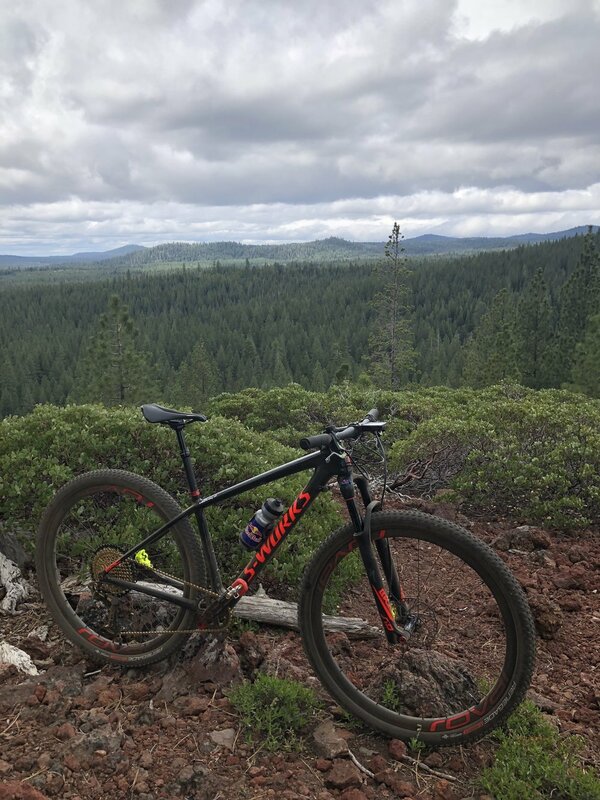 Where I rode: It was a quick trip to bend and I am no expert on their trail networks - but I do have a few recommendations! Tiddlywinks is a super fun trail and can be easily shuttled - it is pretty smooth and flowy with some fun and reasonably sized jumps. We also rode Phil's Trail which features a series of well built table tops and fun berms. This trail would have a been a bit more fun if I wasn't on my hardtail, but I highly recommend checking it out. These were just a few of my favorites from the short rides we did, but I hope to return for some epic rides and more exploring this fall! From what I have seen, there is no shortage of amazing single track to be shredded. Tour De Taco: A pursuit of tasty tacos on bike rides around the world. One of my favorite parts about being a professional cyclist is being able to travel all over the world and experience new places and cultures by bike. It is a pretty special experience to ride around a World Cup venue and realize that you may have just heard 10 different languages being spoken in the course of a few moments. These experiences not only spark my curiosity about other cultures - they also reveal the ways in which the unique cultures of the country, state and city that I grew up in have shaped my interests and preferences. One of those preferences - a very strong one I might add - is my love of tacos. When traveling in the states or training at home, I love seeking out great tacos at the end of an epic ride. After a few social media posts, my love of tacos has become a running joke and when I visit new places, kind souls often message me with their local recommendations. This blog will be a place to document my journey as I test out tacos around the country and world. Hopefully it will be a win-win for everyone! I will be doing the heavy lifting of taco tasting and fellow travelers will get to cut corners and head straight to the best spot in town. I am also a firm believer that tacos are best enjoyed after a long bike ride! Tacos are actually a great food to help you refuel - they have carbs (tortilla, rice, beans), protein (meat if not a vegetarian, beans) and you can be sure to incorporate some healthy fats (avocados!!!). I will try to include ride recommendations in the area for each of the places I review. Consider your day planned. Finally - a disclaimer. I am not actually an expert on tacos - but I really do like them and eat them often. I will do my best to give an honest and fair assessment. As my dad says when tasting wine - "the only thing that really matters is whether or not you like it". Like fine wine, fine tacos can be analyzed on so many different levels - authenticity, quality, size, taste, etc. - but for the moment I am going to stick to talking about overall experience, enjoyment and deliciousness. First stop: Palo Alto, California.